Located near the mountaintop of Mt. Tamaki that is at the southern end of the Omine Mountains, this shrine is also called Tamaki Sansho Gongen and is the protective shrine of the Totsukawa area. It is most probably the oldest shrine of Japan. It is said that Mt. 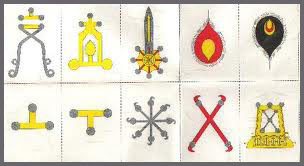 Tamaki is a sacred place for gems, stones and mountains, and they came to the origin of the worship. Accommodation facilities were built since the Kamakura era and it became a sacred place for Shugendo. In the compound, there stand the main hall, child shrines, shrine office, kagura ritual dance hall, ema hall and shoro bell hall and 3,000 years old cedar trees. 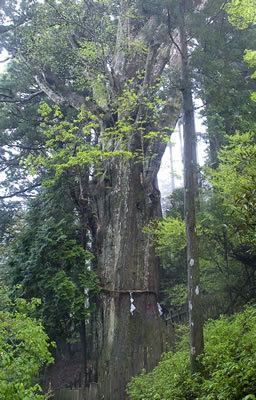 With in the precincts are huge aged cedars (Jindai-sugi, Tokotachi-sugi, Iware-sugi, O-sugi and other cedars) designed as natural monuments. 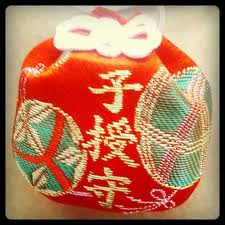 is an annual grand festival held on October 24 at Tamaki Shrine. Male worshippers clad in maiden-style dress and holding white bows and arrows play sacred music and dance in a rare ritual called Yumi-kagura. Close to the summit of Tamaki mountain you can find Tamaki shrine; a quiet shrine with a magnificent air flowing freely around it. Made completely of wood, everything from the front office to the shrine kitchen is becoming a valuable cultural asset. 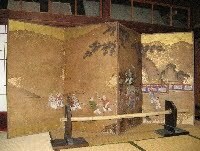 Also inside the shrine is a special screen painting made by one of the disciples of the Kano style of screen painting. It was gracefully painted on a sliding door made of cedar. One of the first kami to appear in the mythical accounts of the unfolding of heaven and earth. Believed to represent the "foundation of the land," the name originally indicated an abstract being without concrete form or attributes. In Kojiki, Kunitokotachi appears at the beginning of the "seven generations of kami" which emerge following Amenominakanushi and the four other "separate heavenly kami" (kotoamatsukami). On the other hand, Nihongi's main text and three "alternative writings" suggest that Kunitokotachi was the first kami to appear out of the chaos following the separation of heaven and earth. 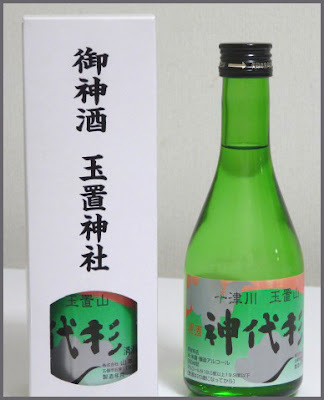 It is generally believed that Kunitokotachi represents a primitive deity originating from a tradition independent from that of Amenominakanushi. 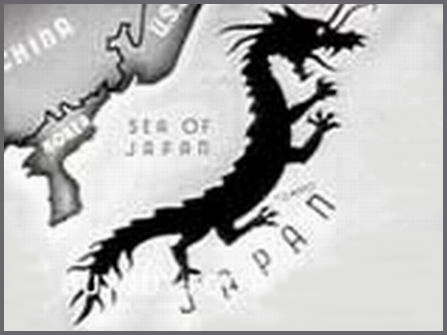 are the flesh of the Dragon Kunitokotachi.! When Jinmu Tenno passed here on his way to the North-East he offered (put (OKI 置) the four heavenly jewel treasures (tama 玉 ) at this place, hence the name, lit. "Shrine where the Jewels are layed down".
. Jimmu (Jinmu Tenno 神武天皇) in Kumano . and the legend of the three-legged crow 八咫烏 yatagarasu 八咫烏.
. Isonokami Shrine (石上神宮, Isonokami-jinguu . Yoshino-Kumano National Park in the Kii Mountain Range. Famed for centuries for its mountains and temples and shrines (also the home of the legendary Tengu Goblin, the slayer of vanity), this region of Japan is very mountainous, with steep ridges, complicated peaks, and vast gorges. One of the most prominent religious sanctuaries since the Heian Period. 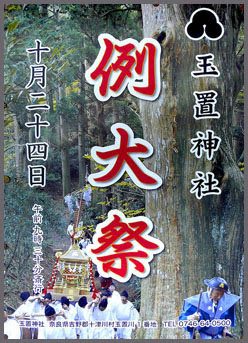 The Yoshino region southeast of Osaka is the northern entrance of the Nyūbu 入峰 (mountain pilgrimage). The Ōmine mountain range between Kumano and Yoshino includes places of seclusion and ascetic practices such as Ozasa, the Shō rock carvern, the Zenki valley, and Mt. Tamaki. 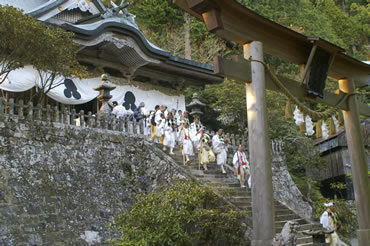 The pilgrimage path leads from Yoshino through Ōmine to Kumano.